Greetings, Kotaku readers. Or I should say, the five people who are reading this site right now instead of blowing one another to smithereens in Modern Warfare 3. Here is our nightly open thread, bolstered by some conversation-starters contributed by several members of the Kotaku editorial staff. 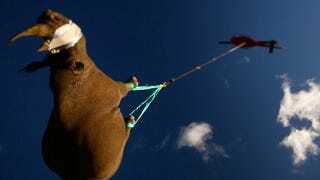 Black Rhinos are airlifted by their ankles to a safe haven — sometimes the title says it all. Heavy D is dead - RIP. Batman Pulls a Chris Hansen, Trolls a Predator - Nice. I always kind thought Chris Hansen might be Batman. Alice Taylor at the Wonderland Blog shares some 3D Settlers of Cattan models — very cool. Here is an album that Peter Gabriel's making of all his music accompanied by an orchestra — in case you needed reminding that Peter Gabriel is a total badass. And that's that. Discuss, and see you tomorrow!